It feels like forever since I posted (it was only last Thursday), but so much has happened in the days between. My 10 YO had a birthday party to attend and a Girl Scout cookie booth to be part of on Saturday. Before and after those two events, my husband and I had more painting to do in the bathroom (we're going from a deep hunter green to a light, crystal-waters blue). OH! One more thing before I show my card today. The deadline for Paper Crafts' Stamp It! publication call ended yesterday, and I wound up submitting 23 projects. !!! Yes, that took up so much of my time the last three weeks. I enjoy the publication calls because I am pushed creatively further and further. In fact, as the deadline approached, I felt that my cards were getting better and better. Let's see if the Paper Crafts gals agree! I should find out by Friday if I've made it in. This card goes to my mom for Valentine's Day. All those flourishes and etchings make me happy! I'm anxious to make a card using the birdcage stamp soon. I used a sticker from Heidi Grace called Quotes & Phrases - Happiness. It looked a bit plain next to that glorious pot of flowers, so I surrounded it with pearls. Of course! A big thank you to those of you who have offered advice on both cameras and hand pain. I am absorbing everything you say, and can't wait to get a new camera....and control this arthritis! 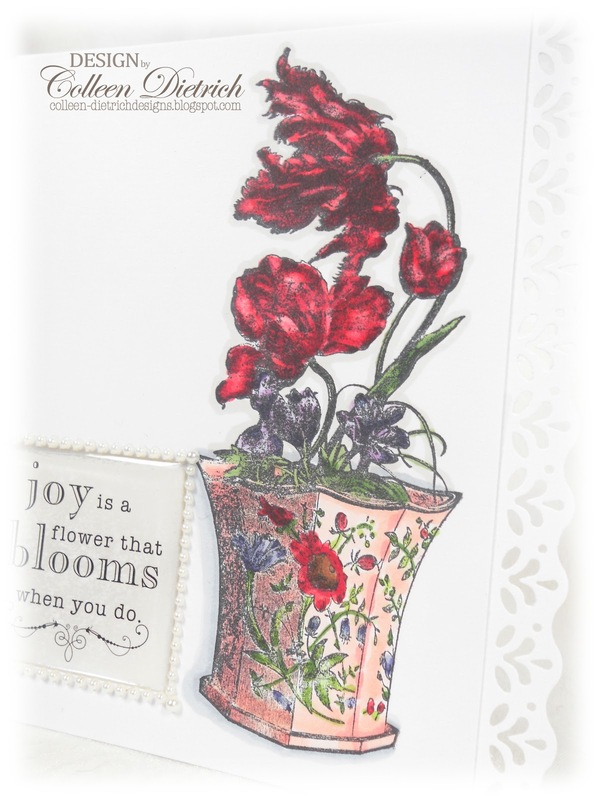 What a ebautiful image, and a gorgeous card you have made with it! A lovely card for your mum, and I love the sentiment! 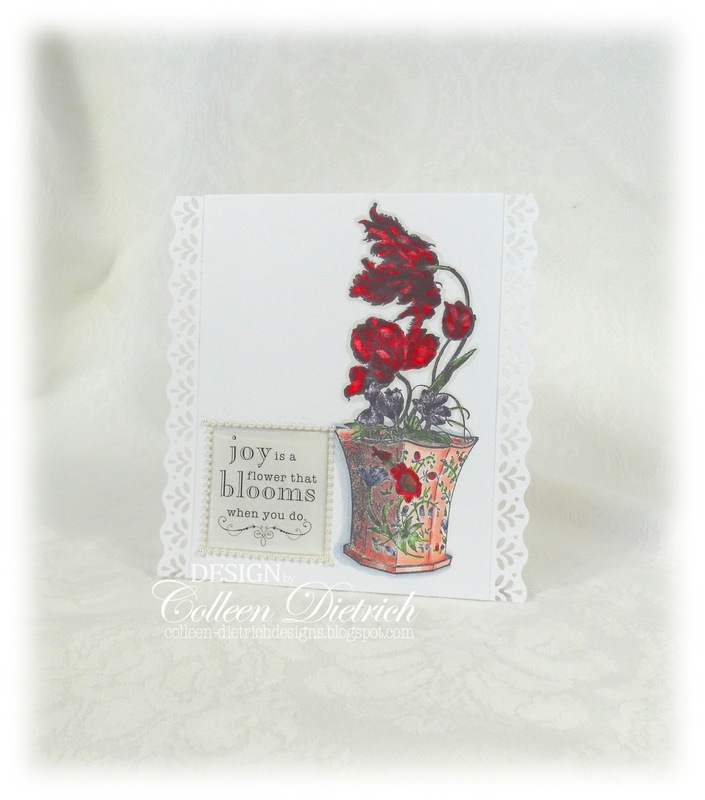 Beautiful Victorian card, Colleen! Good luck with your entries! These tulips are as beautiful as the Christmas ones. I love the edging to and all the details on the can. Gorgeous! WOW! Sounds like you have been SUPER busy! LOVE that you got to spend some time with Andrea and her fam! Happy birthday to your little one! And WOW! 23 submissions??? I'm not submitting much right now--I found it was way too stressful for me. So I'm taking a break. But GOOOOOOOOD Luck to you! And WOWx2! That card is beautiful! LOVE that pot that the flowers are in--it looks so real! GORGEOUS coloring! Your creations ALWAYS amaze me! 23 cards! Wow you could start your own magazine! And I bet they are all gorgeous - just like your Valentine! Wow, 23 cards where did you find the creative mojo??? I had every intention of trying to submit for the first time, but I got a huge commissioned job that has been taking up my time...and with the usual Birthday parties as well...I need to clone myself. Woohoo on all of those submissions Colleen! I'll keep my fingers crossed for you (not that you need it with all of your GREAT work!). This card is a real looker and your mom is going to LOVE it!! Gorgeous image and fabulously coloured! Love the punched borders. Good luck on the submissions! wow! this is beautiful! amazing coloring! I'm sure I'll be seeing you in Paper Craft's Mag! Love everyone's comments! 12 submissions - good lord, that is definitely almost a whole issue! 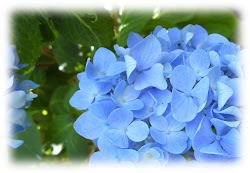 I can almost see the banner of the magazine now with the huge hydrangea on it! Love your tulip card for your mom. We had some of those when we lived in Iowa City - red ones and then red and gold striped ones with that fun fringe on them. Your coloring is so pretty. Your mom will love the card. Looking forward to seeing your name in print as well as the projects! Good luck kiddo! Gorgeous, gorgeous! I am loving those Blockhead images. Your Mom is sure to love this card. Good luck with the projects you sent in. Twenty three!! Wow, you have been a busy bee. Colleen, this card is STUNNING. I love the dark red you chose for the flower, and the white background makes it even more beautiful. Wow, I cannot wait to see your work! 23 submissions is amazing! I wish I had the courage to submit! Love the tulip image, I know your mom will too! Thanks for joining us at the Paper Players...so happy you are enjoying this week's challenge! Hi Colleen! Sounds like you had a fun and full weekend. This card is SO pretty! You work magic with those Blockheads stamps. Your mom will adore the beauty of a card, I'm sure!! 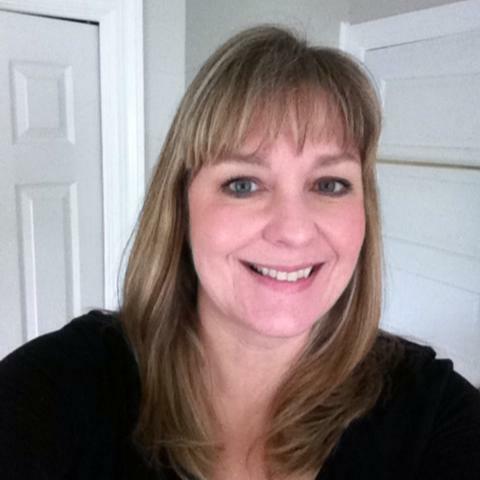 Stunning, as always Colleen! Your coloring is gorgeous and I am delighted you joined in my flower challenge at The Paper Players! This is truly a beautiful stamp and you've allowed it to shine in all its glory on your all white card. I'm glad I got to see this. Can't wait to see what you do with the birdcage! What a gorgeous card. Love the image and your coloring is beautiful.. Thanks so much for playing along with us at City Crafters Challenge Blog.. This is absolutely GORGEOUS! Thank you so much for playing along at CCCB! We certainly had a great time...thanks for inviting us! 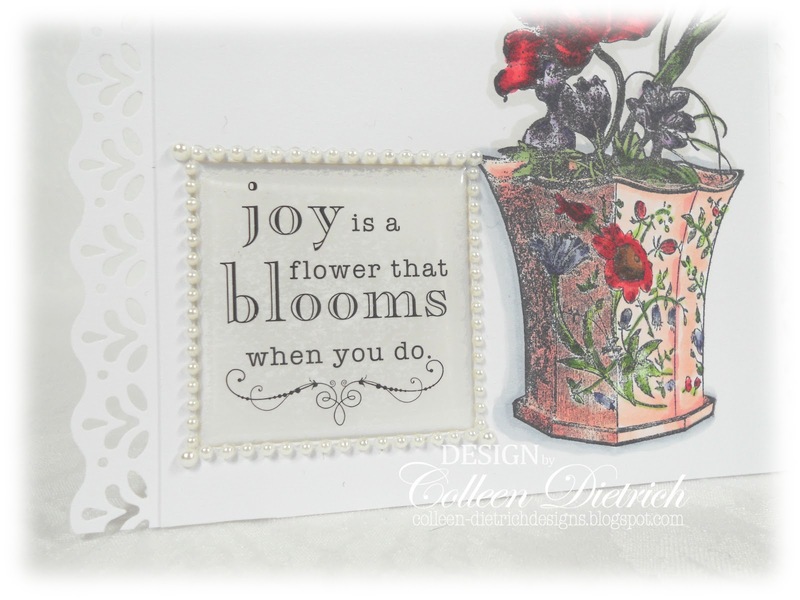 Your card is simply gorgeous...the colors, your coloring and the layout really complement each other!